Something that I really have nailed this year is ensuring we regularly have fresh flowers in the house more often. It's been delightful and has noticeably improved how cheerful it feels in the room, do you agree? 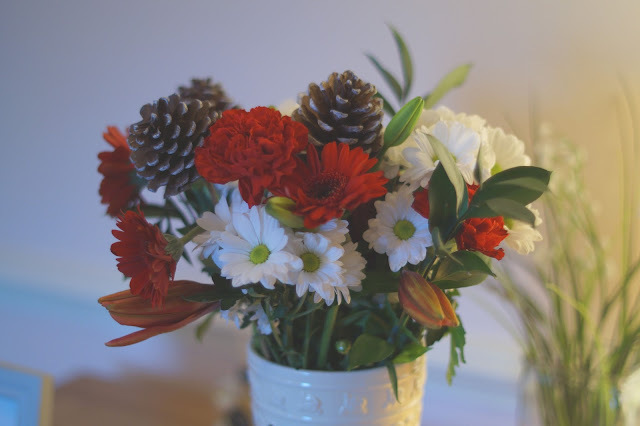 Christmas is no exception and there are some wonderfully festive ways to display flowers at this time of year; reds are just what's needed at the moment. 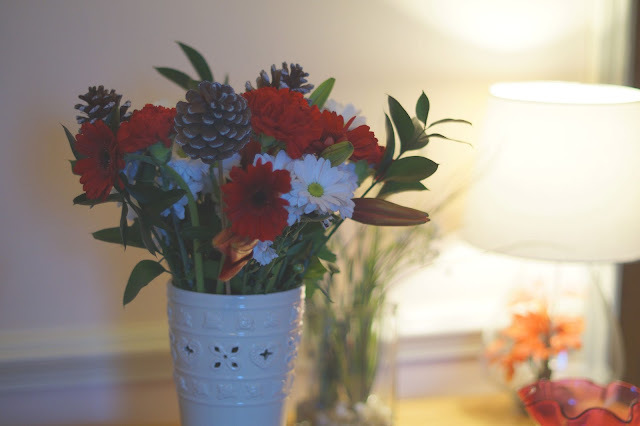 This gorgeous Christmas bouquet was sent to me by Blossoming Gifts and I'm over the moon, it's called 'Christmas cheer' which seems apt as it brightens up the place no end. The bouquet itself has an Asiatic lily (which is now in full bloom but when these pictures were taken they are harder to spot! ), along with chrysanthemums,carnations, salals and germinis and some sweet frosted pinecones too for an extra special Christmassy feel. 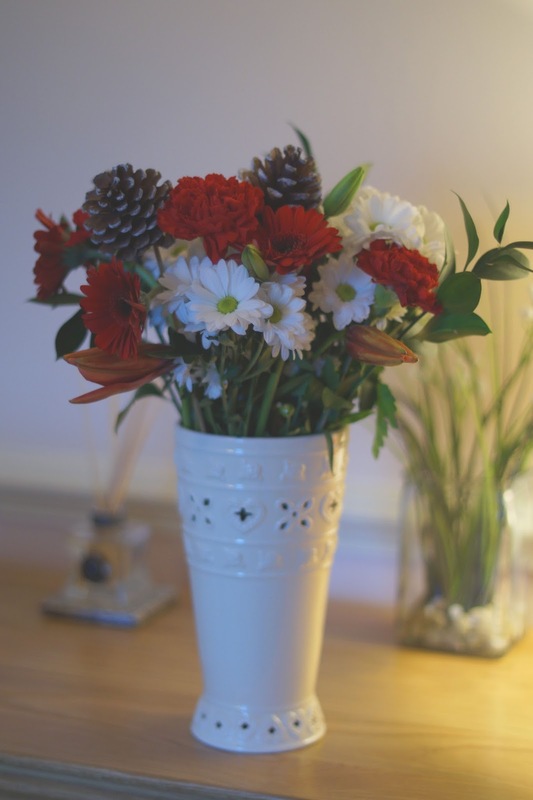 This pretty white vase was a Christmas present itself a few years ago and it's perfect for most of the flowers I buy throughout the year, being a neutral colour it really emphasises each bouquet to the max. As is the trouble with this time of year, the light inside at home is horrendous for photography, so I apologise for these pictures but they're the best of the bunch. The hallway is notoriously dark and even during the day I struggled to get any images I was satisfied with, so frustrating! I'm really enjoying this vase of jollity, my mornings have been even brighter and every time I pass it I casually admire the flowers (although I do cringe at my dreadful attempts at their arrangement). Want to reap some extra Christmas joy yourself? 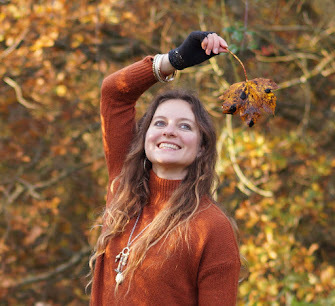 (Or selflessly spread some to treasured loved ones) then have a little treat on me with this 33% discount code for Blossoming Gifts - just quote BGIFTS33 and voila. Do you like flowers at Christmastime? these are pretty, I like the addition of pine cones. I always try to have lots of flowers about for Christmas, with something really nice as a centrepiece.